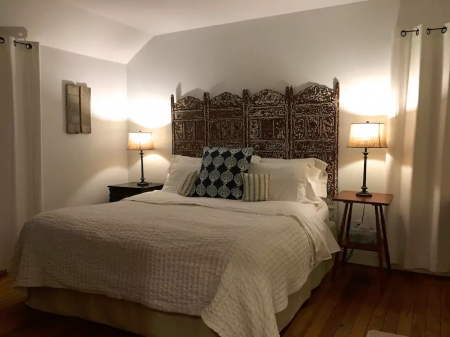 Our guest cottages near New Paltz NY offers you Hudson Valley lodging with breathtaking views of the Shawangunk Ridge and Mohonk Mountain House. We are close to the Mohonk Preserve and Lake Minnewaska State Park if you enjoy hiking or biking in fresh mountain air. Enjoy world class rock climbing in The Gunks, regarded as one of the premier sites for rock climbing in New York State and the United States. Step back in time in the privately owned shops in New Paltz, Woodstock, and High Falls. Our proximity to the Culinary Institute of America means you can't go wrong at any of the great restaurants in High Falls, New Paltz, or throughout the Hudson Valley. The wineries in the Hudson Valley are among the finest wineries in New York State. 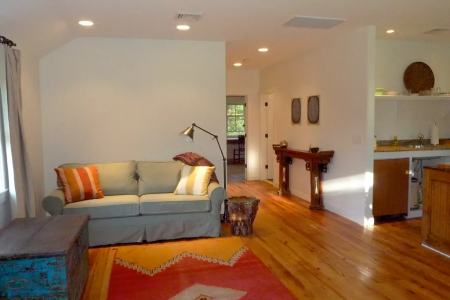 When day is done you will appreciate the comfort and privacy of your cozy Catskill Mountain Guest Cottage. Our renovated 1930's cottages retain their rustic charm. They are private with comfortable spacing between each and our home on nine acres. Mature trees shade each cottage, surrounded by meadows and mountains. The decor is simple, mixing old with new. Each cottage has kitchen, bathroom, heater, A/C, TV/VCR, DVD, and CD player (no TV service). WIFI access on the property. Sheets, bath towels and our homemade soap are provided, as well as our homemade granola, teas, fresh ground organic coffee. On Sunday morning we deliver fresh baked scones to your cottage. Each cottage has a refrigerator, stove, toaster oven, coffee maker, microwave, plates, silverware, glasses, utensils, pots and pans as well as dish soap, sponge, cooking oil, salt, pepper and sugar. A grill and untensils are provided at each cottage, just bring charcoal. Water comes from our private well. You’ll find the cottage clean and the beds made, ready to bring your loved one and some groceries. Please enjoy this peaceful place.